Two-time Olympic Games team gold medalist Beezie Patton Madden, who won the Cacchione Cup in 1984, is one of the IHSA's most celebrated graduates. Photo by Louise Dooley. Some past winners of this prestigious championship recall what the experience meant to them. Every year since 1973 the USEF Cacchione Cup has honored the national individual hunter seat high-point rider in the Intercollegiate Horse Show Association. Over the years the coveted prize has been awarded to a broad spectrum of equestrians. Some of them made careers out of riding and went on to win Olympic medals, while others pursued different endeavors. Many of them remained involved with horses regardless of their competitive aspirations. 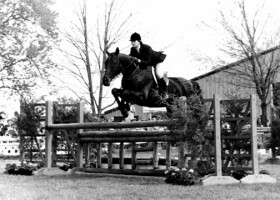 The winner of the inaugural Cacchione Cup in 1972, riding for the University of Connecticut, Duncan Peters, DVM, MS, still rides and shows hunters and jumpers. He has also played polo, winning national championships in college and later coaching the polo team at the University of California, Davis, where he attended veterinary school. An FEI-certified equine veterinarian, Peters, 57, Kalis-pell, Mont., is director of the sport horse program at Hagyard Equine Medical Clinic in Lexington, Ky. Peters specializes in performance horse management programs and therapies for equine athletes. Quite a few IHSA champions graduated to become elite riders. In 1984, Beezie Patton (now Madden) won the Cacchione Cup riding for Southern Seminary College (Va.). Today she’s one of the leading show jumping riders in the world whose accolades include team gold medals from the 2004 Olympic Games in Athens and the 2008 Olympic Games in Hong Kong, where she and Authentic also earned individual bronze. She also earned team and individual silver medals at the 2006 World Equestrian Games (Germany). Peter Wylde won the class at the 1986 IHSA Nationals for Tufts University (Mass.). In 2004 Wylde was Madden’s teammate in Athens; he also brought home individual bronze from the 2002 WEG in Spain. International event rider Mark Weissbecker, winner of the 1973 Cacchione Cup, was short-listed for the Olympic team in 1996. He’s a licensed U.S. Equestrian Federation dressage and eventing judge and a USEF eventing selector. Despite these professional accomplishments, Weissbecker noted his team and individual intercollegiate championship as among his proudest achievements, especially since the famous Bert de Nemethy judged the 1973 finals. Weissbecker grew up riding in Pony Club and eventing, but he was not an experienced equitation rider. The intercollegiate format worked to his advantage since he had plenty of experience riding a variety of horses. As is the case with many professional riders, horses take up most of Weissbecker’s time, but he enjoys skiing, running and cycling and practices yoga to stay fit and flexible for riding. Heidi Bossow represented Hollins College (now University) in Virginia as the top rider in the Cacchione Cup in 1985 and 1987. On entering college, Bossow (now Bossow-Casciaro), 44, Woodstock, Ill., was already a successful junior rider on the A-rated circuit. She joined the equestrian team at Hollins to stay tuned up for riding while she earned her college degree. Today Bossow-Casciaro is a USEF R-rated judge for hunters, jumpers and equitation. She also runs a 30-stall show barn, Tievoli Farm (“I love it” written backwards), where she rides and shows customers’ horses, accompanies clients to shows and breeds horses. Additionally, she’s a licensed broker associate with a commercial real estate firm. Though Bossow-Casciaro was already an accomplished rider when she headed to college, she said that her riding experiences at Hollins contributed to her education as a horsewoman. While she judges shows across the country, from Pebble Beach, Calif., to Wellington, Fla., Bossow-Casciaro likes to give back to the intercollegiate riding program and judges at least one IHSA show each year. Jump forward a few years, and Brown University (R.I.) graduate Amanda Forte Barash, 30, Brooklyn, N.Y., dominated intercollegiate riding competition in her time: she won the individual open flat in 1999, the individual open fences in 2000, both hunter seat open team classes in 2001, the Cacchione Cup in 2001, and in 2007 she was the individual alumni fences champion. Barash joined 1974 Bennett College (N.C.) graduate Marty Webster as one of only two Cacchione Cup winners to later win an alumni class at IHSA Nationals. Amanda has two young horses, which she keeps at a family farm in Pennsylvania, and rides on weekends. She competes in hunters and would like to get back into jumpers too. Amanda had great success as a junior before joining the team at Brown. “It’s such an individual sport, but it’s a completely different experience when you’re part of a team. I made good friends that last a lifetime. They do reunions in the city and we have a great sense of camaraderie,” she said. The retirement of the original Cacchione Cup this spring marks the end of an era, but for the riders who participated in intercollegiate riding programs and claimed this award, their legacy lives on. The Cacchione Cup was named for the founder of the Intercollegiate Horse Show Association, Bob Cacchione. He established the organization in 1967, with the help of his professor Jack Fritz, when he was an 18-year-old sophomore at Fairleigh Dickinson University (N.J.). On May 7 the original Cacchione Cup will be retired to make way for a new one during a celebration at the International Museum of the Horse at the Kentucky Horse Park, home of the 2010 IHSA National Horse Show, May 6-9. The rider in each IHSA region who ends the regular season with the most combined open flat and open fences points qualifies to compete at IHSA Nationals in the Cacchione Cup. This competition, during which 31 riders get to flat and jump, determines the top hunter seat open rider in the IHSA. The IHSA includes 372 colleges and universities, with approximately 8,300 riders competing for the 31 national spots awarded based on zones and regions. If you enjoyed this article and would like to read more like it, consider subscribing. “Catching Up With Former Cacchione Cup Champions“ ran in the April 2, 2010 issue. Check out the table of contents to see what great stories are in the magazine this week.